The aim of this study was to assess the efficacy of autologous platelet-rich plasma (PRP) injection for facial rejuvenation. In a 6-month study, 20 female patients were treated with three sessions of injection with PRP every month from October 2011 to March 2012. Patients received 3 ml of PRP, activated with calcium chloride into face and neck skin. The study was evaluated by comparing the preinjection and postinjection photographs using digital camera, by final patient's satisfaction questionnaire, and by physician's impression. A definitive graduated score was found for each patient by adding the final result of each single parameter. Good results were observed in the skin homogeneity and emotional status of the patient without serious side effects. PRP had an effective treatment in skin rejuvenation without serious side effects. Platelet-rich plasma (PRP) can be defined as 'an autologous concentration of human platelets in a small volume of plasma'. This concentrate contains the trophic growth factors that are released once the platelets therein are activated either by calcium chloride, thrombin, or fibrinogen. All seem to be equally effective in activating the platelets . PRP has long been known as an effective treatment in various surgical and medical fields. Face and neck revitalization with PRP is an application that is being explored . Facial rejuvenation utilizing autologous platelet growth factors, such as platelet-derived growth factor, transforming-growth factor, vascular endothelial growth factor, insulin-like growth factor, and epidermal growth factor, is a natural approach to restore dermal degeneration . Autologous PRP offers regarding facial rejuvenation: quantifiable improvement of skin complexion was observed with visible changes noticeable in 3-4 weeks, especially forehead, cheeks, neck, and back of hands; it is not a volumetric filler but a biological cell therapy with patient's own cells and a popular, relatively painless injectable treatment for the aging face in cosmetic practices . The aim of the study was to evaluate the autologous PRP injection for facial rejuvenation, to assess the final patients' satisfaction, and to assess whether there is any side effect. This study was carried out in the Dermatology and Venereology Department, Faculty of Medicine, Benha University Hospitals from October 2011 to March 2012. Twenty healthy female patients with different types of facial wrinkles were enrolled in this study and treated with one session of injections with PRP every month (a total of three sessions); their age ranged from 30 to 55 years with Fitzpatrick skin types III to V.
History was taken from each patient including personal history, present history, family history, history of drug intake, irradiation, chemotherapy, history of previous treatment, cosmetic surgery, allergy to previous treatment, and sun exposure. Clinical and dermatological examination was performed. Systemic diseases including hemodynamic instability, sepsis, acute and chronic infections, and chronic liver disease. Patients signed informed consent, which was approved by the Ethics Committee of Human Research, Benha University, and were counseled as to the benefits and possible adverse events of the treatment before the first session. The study was photographically documented for the results' evaluation, using a digital camera (Lumix DMC-FX07; Panasonic, Japan). The photographs were taken at every treatment session (T0, T30, and T60) and at 1 month after the last session (T90). The results were evaluated 1 month after the last session by a photograph score, a patient's satisfaction score (PSS), and a physician's satisfaction score (PhSS). Finally, a definitive graduated score (DGS) was calculated for each patient. Ten milliliters of venous blood was aspirated from the patient by venipuncture of the median cubital forearm vein using a 21 G butterfly needle. Five special 2 ml vacutest tubes were prepared. The blood was collected in special sterile vacutainer tubes containing an anticoagulant Na citrate 3.8%, which centrifugally separates red blood cells from plasma that contains 'buffy coat' (white blood cells and platelets). Each test tube was centrifuged at 1100 rpm for 6 min at room temperature. The plasma was gently aspirated from each test tube into a syringe and transferred to a second tube then centrifuged again at 3000 rpm for 10 min at room temperature, thus obtaining a two-part plasma: the upper part, consisting of platelet-poor plasma, and the lower part, consisting of PRP. The platelet-poor plasma was first gently aspirated to avoid its mixing up with the PRP. The residual PRP was subsequently aspirated from each test tube and prepared for activation by calcium chloride in the proportion of 0.1 ml of CaCl 2 per 0.9 ml of PRP, thus obtaining a concentration of activated PRP. Before injection, the target skin surface was cleansed thoroughly with alcohol pads. Topical EMLA cream was applied 1 h before injection. Approximately, 3 ml of PRP was produced per tube; this activated PRP was then injected intradermally through a 30 G needle. The injection techniques applied varied according to the injection location; in the nasolabial folds, a 'linear threading and fanning' injection was the technique used for injection. The totality of the needle was introduced into the center of the nasolabial fold, and the product was injected by withdrawing the needle gently. The injection was made and the bevel of the needle was turned to the top. In the forehead and crow's feet, a solution was intradermally injected in every site, using a 'serial puncture' technique, whereas in the glabellar furrows a 'linear threading' injection was the technique used for injection. When the injection was finished, it was necessary to compress the points that bleed for few seconds and to put an ice pack for 5 min. Topical antibiotic cream (fusidic acid 2%) was gently applied to the treated area. The results were evaluated 1 month after the last session according to Redaelli et al. by comparing the preimprovement and postimprovement photographs taken with the digital camera and by evaluating the final PSS and the PhSS. They are calculated as follows: 0 = no result; 2 = moderate result; 4 = good result; 6 = very good result; and 8 = excellent result for each. The improvement result was obtained by confronting (all the results met each other to get the final result DGS) these three parameters. Finally, a DGS was found for each patient by adding the final result of each single parameter. The DGS improvement result was calculated as follows: 0-4 = none; 5-8 = moderate; 9-16 = good; 17-24 = very good; and 25-36 = excellent. (4) Extreme = extremely deep and long folds; detrimental to facial appearance; 2-4 mm V-shaped fold when stretched. The collected data were tabulated and analyzed using statistical program for social science, Panasonic, Japan version 17 software. Categorical data were presented as number and percentages, whereas quantitative data were expressed as mean and SD and error. The χ2 -test, the Student t-test, and Spearman's correlation coefficient (r) were used as tests of significance; the accepted level of significance in this work was stated at 0.05 (P < 0.05 was considered significant and P < 0.01 highly significant). This study included 20 female patients; their age ranged from 30 to 55 years with a mean ± SD of 41.2 ± 5.6 years. According to Fitzpatrick's classification of sun-reactive skin types, 10 patients (50%) were of skin type III, four patients (20%) of skin type IV, and six patients (30%) had skin type V. All patients were injected at six facial locations: horizontal forehead lines in six patients (30.0%), glabellar frown lines in four patients (20.0%), nasolabial folds in six patients (30.0%), crow's feet lines in two patients (10.0%), smile lines in one patient (5.0%), and horizontal nasal bridge lines in one patient. The mean ± SD of Wrinkle Severity Rating Scale (WSRS) score for the nasolabial folds before PRP injection was 2.33 ± 0.51, whereas after injection it was 1.5 ± 0.83 with an average percentage of improvement of 38.8%, which was statistically significant (P < 0.05) [Table 1] and [Figure 1]. The physician and photographic assessments for the horizontal forehead lines, glabellar frown lines, crow's feet lines, smile lines [Figure 2], and horizontal nasal bridge lines using the facial wrinkle scale revealed that the mean ± SD of facial wrinkle scale before injection was 1.86 ± 0.66, whereas after injection it was 0.86 ± 0.77, with an average percentage of improvement of 58.3%, which was statistically highly significant (P < 0.01) [Table 2]. A final PSS was calculated; its final average improvement was 3.4, ranging from moderate to good [Table 3]. The result was obtained considering the photographs evaluation and the patient examination. The degree of satisfaction shown in the final doctor's satisfaction score was inferior in the degree of satisfaction obtained to the one reported in the PSS. The average result was 3.0, ranging from moderate to good. Very good or excellent results were never obtained [Table 3]. The final average improvement of the photographs result was 3.5, ranging from moderate to good [Table 3]. A DGS was calculated by comparing the preimprovement and postimprovement photographs, the PSS, and the doctor's satisfaction score. The DGS result was good (average 10.2) [Table 3]. 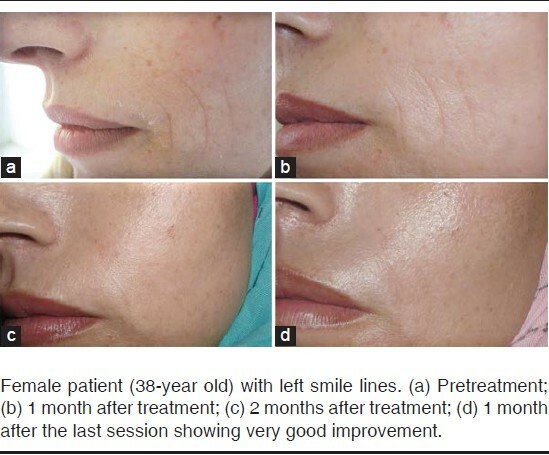 Wrinkles were detected in four patients (20.0%) with photographs, three patients (15.0%) with PSS, two patients (10.0%) with PhSS, and three patients (15.0% (with DGS. Good improvement was detected in nine patients (45.0%) with photographs, 10 patients (50.0%) with PSS, eight patients (40.0%) with PhSS, and 10 patients (50.0%) with DGS. Mild improvement was detected in five patients (25.0%) with photographs, five patients (25.0%) with PSS, eight patients (40.0%) with PhSS, and five patients (25.0%) with DGS. No improvement was detected in two patients (10.0%) with photographs, two patients (10.0%) with PSS, two patients (10.0%) with PhSS, and two patients (10.0%) with DGS [Table 4]. Mild and transient adverse events were observed as follows: 5.0% of patients experienced well-tolerated bruising/ecchymosis; 40.0% of patients experienced a burning sensation for about 3 min after injections, which was probably due to calcium chloride; 75% of the patients experienced mild erythema, which resolved without treatment; 30.0% of patients experienced minimal swelling; and 5.0% of patients experienced headache [Table 5]. No serious cases of infection or hematoma were detected. PRP is an autologous modification of fibrin glue, which has been described and used in various applications with apparent clinical success. PRP obtained from autologous blood is used to deliver growth factors in high concentrations to a region requiring augmentation . 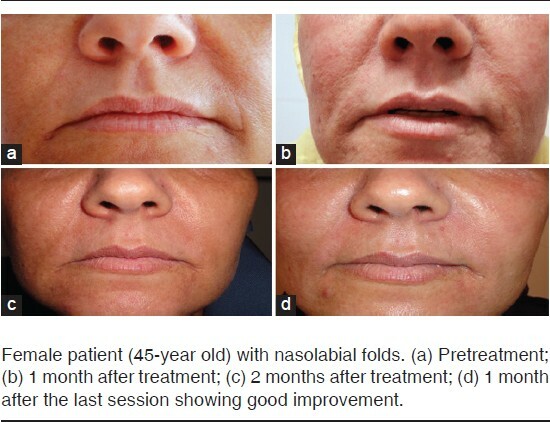 In this study, there are significant improvements in WSRS score for nasolabial folds and for facial wrinkle after PRP injection. These results are in agreement with the results of Sclafani et al. who observed a beneficial effect several weeks after treatment. In the initial follow-up visit 1 week after treatment, they noted the expected partial loss of effect, as the serum injected with the PRP was resorbed. However, even at the 1-week follow-up visit, there was still some clinical effect, which improved over the next 11 weeks, with an average decrease in the WSRS score of 1.13 (P < 0.001); the majority of this improvement occurred by week 2 after treatment. This early response may be because of a number of factors such as residual serum, transient inflammation, edema from the treatment, some volume persistence of PRP, accelerated collagen, hyaluronic acid deposition, or myofibroblast contraction and/or skin tightening. In the present study, the final PSS was 3.4, ranging from moderate to good improvement; the final PhSS was 3.0, ranging from moderate to good improvement; the final average improvement of the photographs result was 3.5, ranging from moderate to good; and the DGS was calculated by comparing the preimprovement and postimprovement photographs, the PSS, and the PhSS. The DGS result was good (average 10.2). These results coincide with the results of Redaelli et al. , who treated 23 patients with different types of facial wrinkles with one session of injections with PRP every month (a total of three sessions); a good result was obtained. Ebisawa et al. described promising results with PRP alone for facial rejuvenation. Tissue culture studies show that PRP can enhance gene expression of matrix molecules such as collagen. PRP is also capable of stimulating fibroblast proliferation ex vivo in the experimental models, and thereby increasing total protein synthesis. PRP can also enhance fibroblast-generated elastin production and myofibroblast stimulation . However, Kim et al. suggested that PRP promotes tissue remodeling in aged skin and may be used as adjuvant treatment to lasers for skin rejuvenation in cosmetic dermatology. Recently, Wasterlain et al. said that PRP appears to trigger an increase in circulating growth factors through activating the biological pathways rather than by serving as a vehicle for the direct delivery of presynthesized growth factors. In the current study, PhSS was inferior in degree to that reported in PSS, because the result provided by physician was obtained considering photographs evaluation, patient examination, and the technique (time, cost, and preparation). In the present work, mild and transient undesirable effects were observed and resolved without treatment, which were also reported by Redaelli et al. .
Facial rejuvenation using your own cells and, more specifically, autologous PRP is a new more natural approach of facial rejuvenation; it is a safe and tolerable procedure. Our result showed that the objective clinical results were good, and patient's satisfaction was high. We recommend that an appropriate cost-effectiveness study has to be conducted to compare different rejuvenation therapies for facial wrinkles. 1. Marx RE. Platelet-rich plasma: evidence to support its use. J Oral Maxillofac Surg 2004; 62 :1046. 2. Rutkowski JL, Thomas JM, Bering CL, Speicher JL, et al. Analysis of a rapid, simple and inexpensive technique used to obtain platelet-rich plasma for use in clinical practice. J Oral Implantol 2008; 34 :25-33. 5. Redaelli A, Romano D, Marcianó A. Face and neck revitalization with platelet-rich plasma (PRP): clinical outcome in a series of 23 consecutively treated patients. J Drugs Dermatol 2010; 9 :466-472. 6. Day DJ, Littler CM, Swift RW, et al. The Wrinkle Severity Rating Scale. A validation study. Am J Clin Dermatol 2004; 5:49-52. 7. Anitua E, Sanchez M, Zalduendo MM, et al. Fibroblastic response to treatment with different preparations rich in growth factors. Cell Prolif 2009; 42 :162-170. 8. Sclafani AP, Ukrainsky G, Romo T, et al. Modulation of wound response and soft tissue in growth in synthetic and allergenic implants with platelet concentrate. Arch Facial Plast Surg 2005; 7 :163-169. 9. Ebisawa K, Kato R, Okada M, Mazlyzam A, et al. Cell therapy for facial anti-aging. Med J Malaysia 2008; 63 :41. 10. 1Schnabel LV, Mohammed HO, Miller BJ, et al. Platelet-rich plasma (PRP) enhances anabolic gene expression patterns in flexor digitorum superficialis tendons. J Orthop Res 2007; 25 :230-240. 11. 1 Kim DK, YJ Je, CD Kim, YH Lee. Can platelet-rich plasma be used for skin rejuvenation? Evaluation of effects of platelet-rich plasma on human dermal fibroblast. Ann Dermatol 2011; 23 :424-431. 12. 1Wasterlain AS, Braun HJ, Harris AH, Kim HJ. The systemic effects of platelet-rich plasma injection. Am J Sports Med 2013; 41 :186-193.